Casa Vista Cerralvo is located directly on beach with no stairs or hills to climb. Beautiful secluded beach home located on 1/2 acre directly on the beach. Main house has 4 bedrooms 3 baths total. 2 bedrooms, 2 bath upstairs, king beds plus one has a twin and the other has a double futon, full kitchen-living room with island, dining room with beautiful patio with dining table that seats 6. Dining table inside seats 10. 300- per night up to 7 people. Downstairs is a completely separate 2 bedroom 1 bath unit with fully equipped kitchen-living dining area and great covered patio with dining tables and huge outdoor bed..Lounge chairs on deck. Each bedroom has a queen bed and one has a bunk with 2 twins. 200- up to 6 people. 2 New studio separate casitas with full kitchen and great patios 125 for the garden king bed casita and 175 for the beachfront king, both with amazing sea views. Rent all or part. Best Kiting beach around without the crowds. Self launching rope on the beach. 3 outdoor showers. 3 gas bbq's 1 charcoal. Rent all 4 for 700- for up to 17 people. we have wifi, American Tv with movies. Everything you need for cooking. We include daily housekeeping service and private chef can be arranged. The view of Cerralvo Island is beyond words. The sunrises are spectacular. A panga (fishing boat) will come right to your door and pick you up for snorkeling, scuba, fishing trips. Sea of Cortez has the best fishing for yellowfin tuna, dorado, marlin, cabrilla etc. World class kite-boarding and windsurfing from October-March. House is located at the preferred northern take-off point for kite-boarding. Kayaks and paddle boards are provided for great fun with the dolphins and incredible sea life. Beach chairs and lounges provided. Daily maid is included and a cook and in home massage therapy can be arranged upon request. House can be rented as 2 bedroom 1 bath, downstairs 200- a night up to 6 adults, 2 bedroom 2 bath, upstairs 300-, or complete house 4 bedroom 3 bath with 2 kitchens for 450-..
New casita has a king bed and large wrap around patio. 520 sq feet. Lounge chairs, BBQ, dining tables. Unobstructed view of the Sea of Cortez. 175- a night. Casa Vista Cerralvo is your home away from home. Keywords: Beachfront Villa-White sandy beach. Rent as 4 bedroom 3 bath or separately as 2 bedroom 1 bath or 2 bedroom 2 bath. 2 separate Studio casitas with king beds. Both with full kitchens and living rooms. House is located directly on the beach. No stairs or hills to walk down. You can find out more info at our facebook page. Casa vista Cerralvo. My husband and I just happened across this beautiful little fishing village about 7 years ago. We just fell in love with it's beauty and it's people. We always dreamed of having a house right on the beach and our dreams came true. La Ventana/ El Sargento has beautiful beaches. We can sit on our beach for days and not see another person during the summer months and the winter months we get to sit and watch all the kite boarders and windsurfers. Right in front of our house is the preferred take off point for the kite boarders to do down winders. House is located on the beach with no houses anywhere near us. Our house is located directly on the beach. No stairs to walk down to get to the beach. Beach is very sandy. We have 6 kayaks and paddleboards. Best kiting beach around without the crowds..
Main house consists of 4 bedrooms 3 baths Upstairs 2 bedroom 2 bath full kitchen. Downstairs 2 bedroom 1 bath full kitchen. Separate from upstairs. Also 2 studio casita each with full kitchen. We are located directly on the beach. No hills or stairs to climb. Self launching rope on the beach. Kayaks and paddle boards included. Upstairs has satellite American TV in living room and master bedroom and 2nd bedroom and downstairs in living room plus each casita. tv's are provided with built in DVD players. Very nice facility ocean front and very nice and helpful owner operators. Loved having you. Hope to see you again soon! This was our second time staying here. Last time we stayed in the Casitas, this time in the upper story of the house. Just a beautiful view from up there! The house is well-stocked with beach towels, kitchen supplies, etc.. There are air conditioning units in the kitchen and each bedroom. Willie and Carol are absolutely wonderful at making sure your trip is everything you want it to be. We like to fish, so they connected us with a local fisherman who drove his boat directly to the beach in front of their property to pick us up / drop us off. We had very successful fishing trips AND (the highlight of my trip) came upon a pod of Orcas that swam right up to / around the boat. It was incredible! Loved having you back and hope to see you next year again. Carol and Willie are great hosts. We hope to come back! Hope to have you back soon. We had an incredible trip staying in the Casitas (two couples in our group)! The view is incredible and they are literally on the beach. They are each set up like a studio, but have plenty of space for a couple (large kitchen stocked with all the essential cooking utensils, a sitting area that looks out on the beach, and a bed with night stands). There is no dishwasher, but a cleaning service is included, so you can leave your dishes in the sink and they will be taken care of the next day while you're out adventuring. Each Casita also has an inside and outside shower (with a door in between). The locations / views are excellent as they are, but they have added hammocks and numerous shaded outdoor seating areas that really help you enjoy the views. Our main mission here was fishing (spearfishing and hook and line fishing) and Carol and Willie helped arrange for us to fish with a local fisherman every day for a very reasonable price. He even picked us up and dropped us off of the boat right on the beach in front of the Casitas! The mission was successful - left after a week with 120 pounds of fish! Seems like we'll be set on fish for a year plus, but I'm sure we'll be back sooner than that! Highly recommend staying here! Loved having you all. Looking forward to your next visit. The BEST "On the Beach" Experience! Came to La Ventana (El Sargento) for a kiteboarding vacation with another couple. This was our first trip here and wasn't sure about staying "in town" or "up the road". We opted for "up the road" and booked the downstairs 2 bed, 1 bath. This is a deluxe property without being too over the top. Everything about this place gives you the feeling that you're on vacation in a special place. From the beautiful sunrises to the pink sky sunsets over the tourmaline colored sea. So many options for water and day-trip activities. The mornings are great for glassy paddle-boarding and/or crystal clear water snorkeling. In the afternoon the winds kick-up and provide a clean sheet of strong predictable winds. Topping off the whole experience are the owners Carol and Willie. They are so kind and caring and committed to making your stay a true vacation that when you leave, you feel like you're leaving your new home behind...but just like me...you'll be back soon! Loved having you all here. Looking forward to your return in January 2018. Oceanfront views, sounds of the waves, picture perfect sunrises, and dolphin sightings from the balcony. 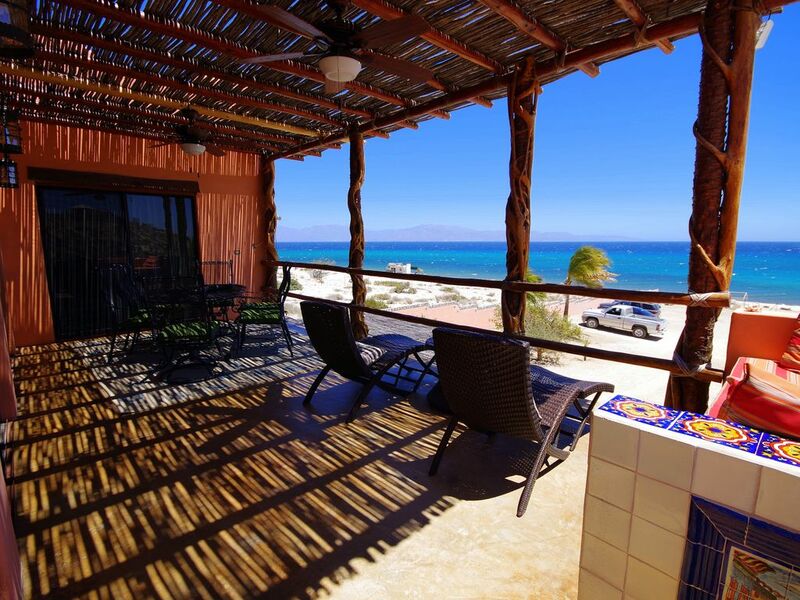 La Ventana / El Sargento in BCS is a wonderful, warm-hearted town with a nice mix of expats, kiters, fisher-people, retirees. Very comfortable and homey (rented the upstairs). Don't miss the fresh seafood in town and snorkeling in the Sea of Cortez! World class kitesurfing (hoping to get up on that board next season!). Thanks for an inspiring stay and "home away from home" at Casa Ornelas. Hope to have you back soon. Loved having you! !